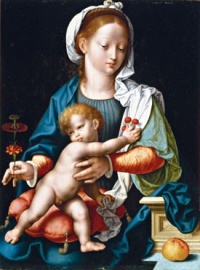 Joos ( also Joost ) van Cleve ( van Beke ) (ca. 1480/90, Cleves - 1540/41, Antwerp), was a Netherlandish painter who was active in Antwerp from 1511 to 1540. He died between November 1540 and April 1541. He was one of twenty van Cleefs who painted in Antwerp, but whether the well-known Henry, Martin, and William (the younger) were kin of his cannot be determined. Of his father, William (the elder), we know only that he was a member of he Antwerp Academy, which body Joos joined. He is the father of the painter Cornelis (Sotte Cleef) van Cleve (1520-c.1569). He is known primarily for his religious and portrait painting. Among his best known works are portraits of Francis I and Eleonora of Austria, King and Queen of France. He collaborated with Joachim Patinir on some works. He is also known for integrating Northern and Southern modes of painting, as wells as using certain aspects of his compositions repeatedly, to please the growing art market. A. Siret, in B.N., IV, 1873. G. Hulin de Loo, Conjecture touchant le Sotte van Cleve. Jan (Joès) van Ghinderick alias van Cleve, in Petite Rev. illustrée de l'Art et de l'Archéol. en Flandre, 1903, 12-13, pp. 87-91 et 15-16, pp. 115-118. Unless indicated otherwise, the text in this article is either based on Wikipedia article "Joos van Cleve" or another language Wikipedia page thereof used under the terms of the GNU Free Documentation License; or on original research by Jahsonic and friends. See Art and Popular Culture's copyright notice. This page was last modified 11:25, 4 September 2012.